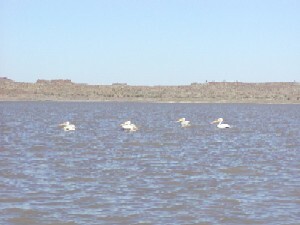 White Pelicans on the Hardap Dam. 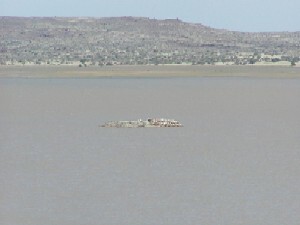 In early May Holger Kolberg stopped at the Hardap Dam and discovered White Pelicans breeding on an island in the dam. The timing was perfect as a ringers get-together was held on Wiese farm (see here for a trip report) and a team was organised to ring pelican chicks on 24 May. 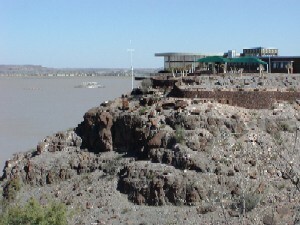 The resturant at Hardap Dam. 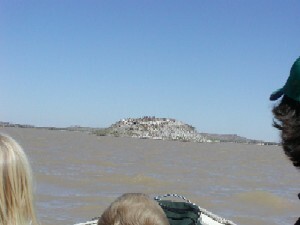 The island on which the pelican's were breeding is in the background. 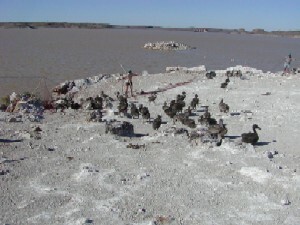 The smaller island to which many of the juvenile pelicans swam after escaping being caught, and after being ringed. Approaching the island on the rubber duck. An estimated 250-300 juvenile pelicans were on the main island. Close-up of the juvenile pelicans. A fishing net was spanned on one side of the island, and then some ringers went around to the other side to herd the juveniles to the net. 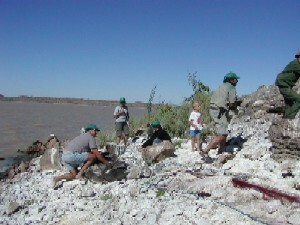 The net collapsed but held about 25 pelicans which could be extracted and ringed. 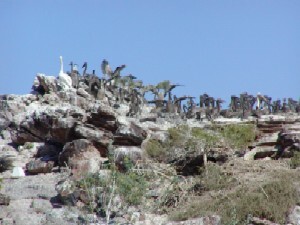 For the second attempt the fishing net was placed on the plateau of the island and another 25 pelicans were herded in. 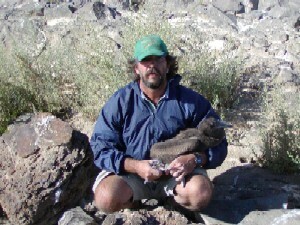 Dirk Heinrich with a ringed pelican. The H-prefix rings used needed water-pump pliers to close. These were rings originally designed for King Penguins but they fit perfectly on pelicans. 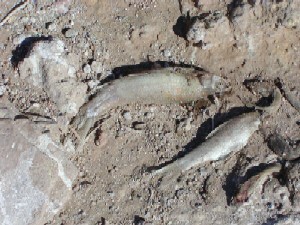 The Hardap Dam has a good supply of fish. Several young pelicans regurgitated their last meal. 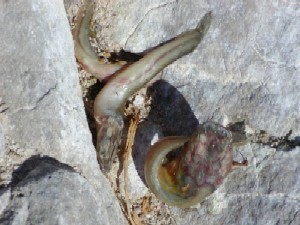 Some of the fish were barbel (Clarias sp. ), yellowfish and carp. 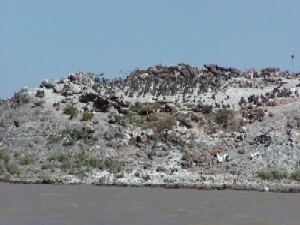 A deserted colony of cormorant nests was found on one side of the island. 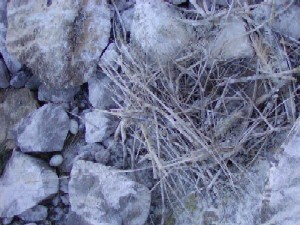 This nest had addled eggs that had rolled off the nest. 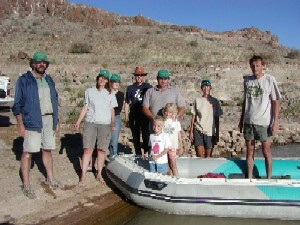 The team of pelican catchers: Dirk Heinrich, Ursula Franke, Stephanie, Michael Brooks, Werner Bader with his children, Claire and Holger Kolberg. The adult pelicans returned to the island as we returned to the mainland. The trip was successful with a total of 65 juvenile pelicans being ringed. Holger will check the island in early August for mortalities. 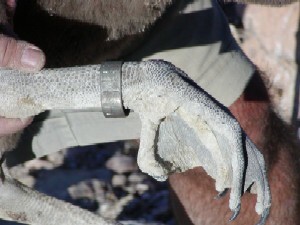 This was the first time lots of pelicans have been ringed in Namibia since the early seventies when a young Hu Berry ringed 70 birds. Thanks to the Fisheries Research Institute who lent us a 50m gill net. 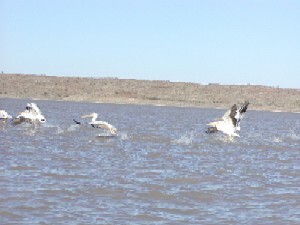 Holger's follow-up visit: "On 29 July, during the wetland bird count, I managed to re-visit the island at Hardap to check on the pelicans. I picked up 17 dead chicks with rings (out of an estimated 100 dead chicks), some of them were dead for less than a week so obviously ringing was not the cause of death. Do you have any information on pelican chick mortality? There may be more but I didn't want to stay too long on the island because the pelicans have already started breeding again! And there are at least ten Blackheaded Herons on nests with up to five eggs in them, two had very small chicks."